So today I went with my realtives to Shin Yeh AYCE buffet at the Mitsukoshi building A11 by the 101. It's smaller than the Ming Yao buffet, but the quality is slightly better. It was really good! I'm so stuffed. I still think it's good to experience both. Quality or Quantity? It has the usual items in a asian buffet. Top grade Sushi, chinese food, fried food and delicious delicious deserts! Oh almost forgot, endless Yakult (養樂多). 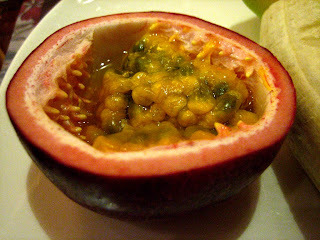 Also they had passion fruit halves. Not a drink, but the fruit itself. Kind of looks alien doesn't it? But Super sweet! I like the one in 101, we went both places with Yo yi. Mitsukoshi has all you can eat sushi even though their choices are less but the quality is the top, the one in Ming Yao, the choices are many beyond I can digest. I think I took both u & Angie to Ming yao buffet 2-3 years ago when we all met in Taipei.